From May through August, 1915, LHA vice-president and field secretary Henry Ostermann led a film crew across the Lincoln Highway. The resulting promotion film, the “Three-Mile Picture Show,” was shown for years but no copies are known to have survived. Luckily for us, and history, Edward Holden was along for the ride — he was Ostermann’s secretary, in charge of the filming but also documenting the trip in photos too. Why dedicate the Lincoln Highway on Halloween? The Lincoln Highway was officially dedicated on October 31, 1913, with bonfires, parades, concerts, and speeches along the coast-to-coast route. Lots of news articles can be found that describe the festivities — from masquerade balls to farmers placing jack-o-lanterns on fence posts — but was there a reason behind celebrating this momentous occasion on, of all days, Halloween? It’s logical that the LHA would have documented its reasons but Kathleen Dow (Archivist and Curator of the Transportation History Collection at the University of Michigan Special Collections Library) says neither the minutes from the LHA’s formation on July 1 nor those from October 27 mention the dedication on October 31. The 31st would have been the 49th anniversary of Nevada’s statehood, and though that was important to President Lincoln’s re-election in 1864, it was not a close enough connection to the new road. The Washington Herald (October 6, 1913) noted that LHA directors had just met in Detroit, coinciding with the Third American Good Roads Congress, and “discussed the arrangements for the dedication celebrations on the night of October 31 at every point along the proposed highway, and the discourses to be delivered by the clergy on Sunday [Nov. 2].” Still, no reason was given. However, we can guess with great certainty that the celebratory nature of Halloween itself, especially being on a Friday that year, was the reason for choosing October 31. Pittsburgh Daily Post, October 26, 1913. The U.S. was just beginning to celebrate “Hallowe’en” in 1913. Trick-or-treating did not become mainstream until the 1950s but there was a centuries-old tradition of fires, parades, and dressing up on All Hallows’ Eve that recent immigrants had brought to America. LHA leaders were masters at harnessing public relations, and what better date to choose for fanciful nighttime celebrations than the one day a year that such activities already took place? Some of that wording likely came from an LHA press release, as an article in the November 1 Salt Lake Tribune similarly noted it had been “the request of the directors of the Lincoln Highway to make October 31 an evening of general rejoicing.” In the next day’s Deseret Evening News, the dedication recap included that the LHA had adopted the now-familiar oval emblem with U.S. map in the middle, and that drawings of it were being sent to contributors. Nebraska’s governor also declared October 31 a holiday, and Omaha had perhaps the largest event in the country. Celebrations started across the Missouri River in Council Bluffs, Iowa, at 12:01 a.m. with fire bells, factory whistles, and a torchlight parade. The Union Pacific Railroad donated carloads of railroad ties and an oil company helped fuel a massive bonfire later that night attended by 10,000 people, plus supplied smaller bonfires lining the route for 300 miles to North Platte. “Lincoln Highway Day” in Wooster, Ohio, included everything from motorcycle races to an onion eating contest. ~Courtesy Francis Woodruff, Dalton Gazette, via Mike Hocker. Motor Age magazine (November 6) reported afterwards on some of the national merriment, most of which included parades and especially bonfires. Some towns, like Wooster, Ohio, renamed the road through the county as “Lincoln Highway” and a restaurant in town rechristened itself the Lincoln Highway Cafeteria. In fact, shops there began the 31st with “Lincoln Highway Day bargains” before closing at noon to start the revelry. Brian Butko is author of Greetings from the Lincoln Highway, revised edition coming in 2019, and the LHA’s official centennial publication The Lincoln Highway: Photos Through Time. The Coan monument is joined nearby by decorative Lincoln Highway lamppost bases dedicated by the city of Clinton, Iowa, in the 2000s. The marker, dedicated with a small ceremony on August 5, 1925, was erected by the Clinton Chamber of Commerce at the southeast corner of Lincoln Way (also now US 30) and Mississippi River Scenic Highway (now US 67). Clinton County was rather progressive for its time; while half the U.S. states spent no finds at all on road improvement, Clinton was paving its roads with gravel. Coan was inspired by an earlier local resident who had experimented with making concrete. In September 1913, Coan became one of the original 10 LHA consuls — perhaps the only name familiar from that initial group is Gael Hoag for Nevada, later LHA Field Secretary and Managing Secretary. In 1914, Coan was elected honorary vice-president of the LHA. Four years later, he passed away at age 57. At the afternoon dedication ceremony, the flags covering the memorial were drawn back by six-year old William Rendall, Coan’s grandson. Gael Hoag was among the speakers, remarking how Coan’s name was held in such high regard at the headquarters of the Lincoln Highway Association. The Athenænum in Indianapolis, site of the meeting in September 1912 that launched what would become the Lincoln Highway. When automobile pioneer Carl Graham Fisher proposed a coast-to-coast highway in 1912, the idea had been around for more than a decade. But Fisher knew how to get things done: he knew the people who could supply materials and funds and promotion on a nationwide scale. Men like Henry Joy, president of Packard, or Frank Seiberling, president of Goodyear, and just about every other manufacturer of cars and parts and highway materials—save Henry Ford. 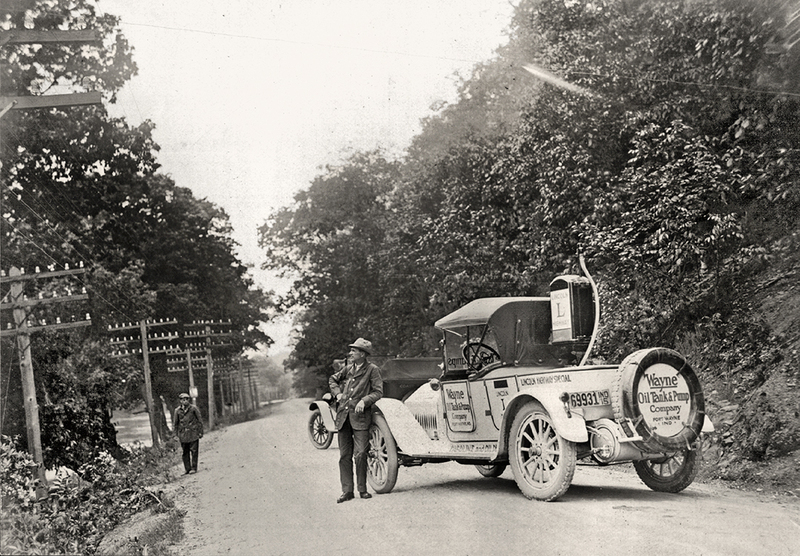 AAA had advocated for a cross-country highway from its founding in 1902. A few paths were named, and for a time in 1911, there was even talk of a cross-country “Lincoln Way.” The New York Times said it would be “a great transcontinental highway to be built by the States through which it will pass”—but it was not to be. A year later, the Old Trails Road (also called the Ocean to Ocean Highway, and later used in parts to lay out Route 66) became the first cross-country route to have an organization behind it, from New York City to Los Angeles. That same spring of 1912, AAA sent renowned pathfinder A.L. Westgard to explore three more possibilities: the Northwest, Overland, and Midland trails. And in August 1912, still a month before Fisher’s meeting, Frances McEwen Belford had a bill introduced in Congress “establishing the Lincoln memorial highway from Boston, Mass., to San Francisco, Cal., ” though the bill died. Finally, on September 10, 1912, Fisher and his business partner and best pal James Allison held a dinner at the Deutsche Haus (or German House, now the Athenæum) in Indianapolis for fellow industrialists to hear their dream of a “Coast-to-Coast Rock Highway.” On July 1, 1913, that road that would officially become the Lincoln Highway. It wasn’t first coast-to-coast road, but the other named routes paled in terms of marking, mapping, funding, improvements, and promotion. It might more accurately be called the first improved coast-to-coast highway. As Fisher told them that night, “Let’s build it before we’re too old to enjoy it.” And a year later to the day, a Proclamation was issued by the Lincoln Highway Association describing the route in general terms. Now the real work would begin…. The Lincoln Highway entered Pittsburgh from the east via Baum Boulevard, the city’s Automobile Row. This neighborhood of large estates near Bloomfield and East Liberty spawned businesses to serve the horse-and-carriage trade between the city and the even-more-upscale suburb to the east. By the early 1900s, these businesses developed into auto repair shops and dealerships. In the above photo, you can see that the Autocar Company was about to demolish one more of the area’s stately homes for its local branch. Autocar, at first a maker of autos, was founded in Pittsburgh in 1897 as the Pittsburgh Motor Vehicle Company. It got its new (and still current!) name in 1899 when it moved to Ardmore, Pa, on the Main Line west of Philadelphia, later to be along the Lincoln Highway. One of its offerings was the Pittsburgher car, but in 1912 the company switched to making only heavy-duty trucks. Ads for Pittsburgh’s new Autocar Factory Branch ran in all local papers on January 18, 1925. Pittsburgh had its own Autocar factory branch near downtown. It would take till 1925 for the new dealership to be built; till then, Autocar Sales & Service filled the 1800 block of Forbes, a few blocks past Mercy Hospital. The new sales and service branch, seen below in 1932, filled an entire triangular corner at Baum Blvd. and Liberty Avenue. Autocar was later absorbed by the White Motor Company, which was later taken over by Volvo Trucks, then acquired by GVW Group, which revived Autocar as an independent company. Autocar, now based in Indiana, continues to produce three models of custom-engineered trucks and holds the distinction of being the oldest surviving vehicle manufacturer in the Western Hemisphere. “Yes, this was indeed ‘the end of the road,’ with all of California yet to see. We had traversed the continent from the Atlantic to the Pacific without an accident or a day’s illness, and with only two punctures! We look back on comparatively few discomforts, and many, many pleasures and thrilling experiences, with keen satisfaction. “Beyond Reno the ascent of the Sierra Nevada begins, and you pass Lake Tahoe, six thousand feet high, the most delightful summer-resort region in America. The Lincoln Highway joins the other routes here, and is really a highway, making a glorious finish in Lincoln Park, San Francisco. One of the finest views is the mighty canyon of the American River, with the timbered gorge and the rushing stream two thousand feet below. You are held spellbound by the scenery, as you descend the western slope to Sacramento, the capital of California, 125 miles from San Francisco…. “We were landed at the ferry slip, and with a sensation never to be forgotten we drove off the wharf into San Francisco — ‘the city loved around the world’ — built upon hills overlooking the expanse of the Pacific, with a cosmopolitan throng of half a million people. We could not have reached here at a more fortunate or auspicious time. San Francisco was en-fete in honor of the fleet. Every street and building was festooned with flags, banners, and garlands of flowers…. Bands were playing, auto-horns were tooting, and the air was alive with excitement — joyous, over-bubbling pleasure, that had to find a vent or blow up the place…. “We had come 442 miles, from New York to Pittsburgh, over fine roads and through beautiful country. Approaching Pittsburgh, we came in on a boulevard overlooking the river and ‘valley of smoke.’ Great stacks were belching out soot and smoke, obliterating the city and even the sky and sun. They may have a smoke ordinance, but no one has ever heard of it. We arrived at the William Penn Hotel, in the heart of the business center of the city, a first-class, fine hotel in every regard. We found the prices reasonable for the excellent service afforded, which was equal to that of any New York hotel. The dining-room, on the top of the house, was filled with well-dressed people, and we were glad that we had unpacked our dinner clothes, and appeared less like the usual tourist, in suits and blouses. “It was frightfully hot during our two days’ stay. You go out to drive feeling clean and immaculate, and come in with smuts and soot on your face and clothes, looking like a foundry hand. The office buildings are magnificent, and out a bit in the parks and boulevards the homes are attractive, and many are very handsome, especially in Sewickley. But aside from the dirty atmosphere one is impressed mostly by the evidences of the outlay of immense wealth. An enthusiastic brother living there took us through a number of the business blocks, and told us of the millions each cost and the almost unbelievable amount of business carried on. I can only describe Pittsburgh as the proudest city I’ve visited. Not so much of the actual wealth represented, but of what the billions had accomplished in great industries. A 1920s postcard of Reel’s Corners, Pa., (now US 30 and PA 160), part of the famed “Seven Mile Stretch” on the Lincoln Highway east of Stoystown.